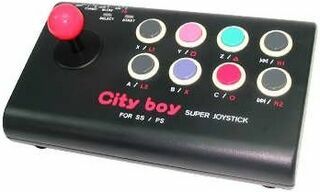 The City Boy 2 is an arcade stick compatible with both the Sega Saturn and PlayStation. It is a successor to the City Boy and shares a similar feature set, albeit with a different colour scheme. The history of the City Boy 2 is not fully understood. It was distributed by Blaze in Europe in relatively small quantities, though it was likely released elsewhere.